The 1913 Liberty Head Nickel is one of the most valuable coins in the world. Only 5 specimens are confirmed to exist, although there is an intriguing hint that there might be a sixth. The finest-known 1913 Liberty Nickel is valued at a minimum of $5 million, the price for which it sold in May of 2007. The Liberty Head Nickel, designed by Charles E. Barber, was minted from 1883 to 1913. Like nickels still being minted today, the coin actually has more copper in it than nickel, being comprised of 75% copper and only 25% nickel. 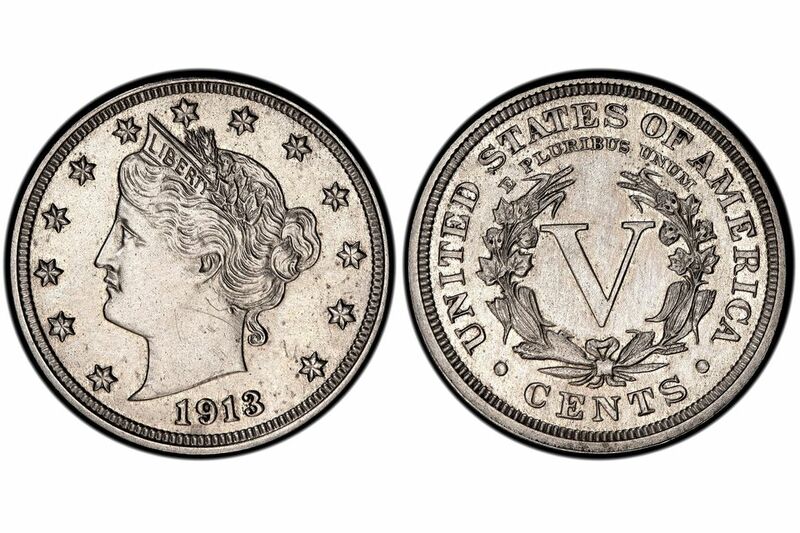 The Liberty Head Nickel type, also called a V Nickel because of the large V on its reverse, was a well-publicized coin from the very beginning. Officials at the Mint failed to place the word CENTS on the coin, and it wasn't long before enterprising scammers began plating the nickels in gold and passing them off as $5 gold pieces! This was possible because the Liberty Head Nickel was a brand new type, and people weren't familiar with it yet, plus it was about the same diameter as the $5 gold piece. Without the word CENTS on the coin, all the scammer had to do was buy a small item priced below 5 cents, pay with a gold-plated nickel, and wait to see whether he got change for 5 cents or $5. In one well-publicized court trial, a jury was unable to convict the alleged scammer because nobody could testify that he had ever said that the coins were worth $5. Perhaps the only reason he never said it was that he was a deaf-mute! Rumors began to fly, fueled by the press and by coin dealers with specimens to sell, that the new Liberty Head Nickel was about to be recalled by the Mint because of the serious "error" of omitting the denomination. People began hoarding them, and today, 1883 "no cents" specimens can readily be found in high grades as a result. The Mint changed the design of the Liberty Nickel to add the word CENTS about halfway through the mintage run. Thus it was that the Liberty Head Nickel became a favorite of the coin dealers and the media from its very inception. Why is the 1913 Liberty Nickel so Valuable? On the face of things, you might ask why this 1913 Liberty Head Nickel is so valuable. There are certainly rarer U.S. coins, where only 1 or 2 specimens exist. There are definitely U.S. coins which are more historically important. Most people would even agree that there are more artistically beautiful coins such as the St. Gaudens $20 gold coin. So why are people willing to pay millions of dollars to own a lowly 5-cent coin? The answer is hype. The 1913 Liberty Head Nickel was part of the hopes and dreams for something better that saw our nation through the terrible Depression Era of the 1930s. Riding on the foundation of this hope, later coin dealers who handled the 1913 Nickels built upon the legend, enhancing and enlarging it. When it comes to the extraordinary premium placed on the price of rare coins, perception is everything, and savvy dealers through the years have created the unshakable perception that the 1913 Liberty Head Nickel is among the most sought-after of all U.S. coins. And they're right! Entrepreneur and enterprising coin dealer B. Max Mehl of Fort Worth, Texas, spent a fortune advertising for specimens of the 1913 Liberty Head Nickel. He promised to pay $50 (the large sum of money back then) to anybody who found one in their pocket change and sent it to him. In addition, for just 50 cents, you could send away for his Star Rare Coin Encyclopedia, which listed the prices he would pay for scores of other coins, (plus it had other useful information about coins, foreign and domestic.) Mehl sparked a nationwide treasure hunt for the nickel that was worth $50, a princely sum of money during the Depression Era. It became the hopes and dreams of millions of Americans, to find that elusive rarity in their change for a dime. It is said that cable cars and tramways would run behind schedule or sometimes even come to a dead stop because the conductor was too busy checking all the nickels he collected in fares, trying to find a 1913 Liberty Head. By the mid 1940's, the 1913 Liberty Head Nickel was an integral part of the national psyche. The coin had become iconic to a generation of Americans, so when specimens were quietly sold off as singles from the original set of 5 or 6 (which until then had been held intact,) they sold for exorbitant sums of money, as much as $3,750 each. Each time a specimen became available, the price got higher, the hype became louder, and the legend grew deeper. King Farouk of Egypt reportedly had two different 1913 Liberty Nickel specimens in his world-class coin collection at different times. Another specimen formed the plot (and starred in) an episode of a major TV series, Hawaii Five-0. A U.S. Ambassador, Henry Norweb, claimed ownership of one, as did L.A. Lakers owner Jerry Buss. And each time a 1913 Liberty Nickel specimen changed hands, the price went up. Where Did the Five Specimens Come From? Not much is known about the actual minting of the 1913 Liberty Head Nickels. It is believed that five specimens were struck at the U.S. Mint in Philadelphia sometime between the Summer of 1912 and early February of 1913. One theory says that the coins were struck as advance test pieces around July of 1912, with the expectation that the series would continue the following year anyway. Another theory proposes that someone was burning the midnight oil at the Mint, and struck the five specimens before the dies were destroyed in preparation for the change to the Buffalo Nickel, which began production in late February of 1913. Whichever theory you subscribe to, it's clear that the coins left the Mint in some unauthorized fashion, and indeed, no word of them surfaced at all until 1920, after the statute of limitations for theft had safely run out. Apparently, U.S. Treasury officials have concluded that they were legally struck, since they've never been confiscated like the 1933 Saint-Gaudens Double Eagles were. Is There a Sixth Specimen of the 1913 Liberty Nickel? According to the December 1953 issue of The Numismatic Scrapbook Magazine, an early owner of the entire set of 1913 Liberty Head specimens had a special plush leatherbound case made for them -- with six coin holes in it! At the time the coins were shown (after this owner's death, and while still in the special case,) one of the coin slots had been filled by a bronze cast of the 1913 Buffalo Nickel. Coupled with the fact of this 6-hole case, we have early attempts by various interested parties to give a provenance for each specimen, and six specimens show up on these lists. Of course, while many people explain away the 6-hole coin case as meaningless, and those who compiled early provenance lists for the 1913 Liberty Nickel got lots of facts wrong and sometimes listed owners (or coins) twice, there is one more intriguing bit of lore that points to the very real possibility of a sixth specimen. One coin collector who was lucky enough to own a 1913 Liberty Nickel specimen for a while was George O. Walton. On March 9, 1962, Walton was on his way to a coin show in his automobile. He had told the coin show promoters that he was bringing his 1913 Liberty Head Nickel with him so they could display it at the show. Unfortunately, Walton never made it, having lost his life in a car crash while en route. Although authorities found thousands of dollars worth of coins at the scene of the wreck, the 1913 Liberty Head Nickel was missing. There was much speculation about the whereabouts of the coin. Some people were certain that someone had stolen it, while others felt it had been lost at the scene. Apparently, Walton's heirs never clarified matters. They had found a 1913 Liberty Head Nickel in Walton's effects at home following his death, and taken it to a leading numismatic firm for authentication. The experts at this firm condemned the coin as a fake (stating that it was a genuine coin which had been altered.) Following this news, the Walton heirs kept quiet about things and for forty years, nobody knew what had ever happened to the Walton specimen. It was presumed lost. The Eliasberg Specimen, PCGS and NGC PR-66, once owned by Louis Eliasberg and now on the auction block, to be sold Jan. 2, 2007 by Stack's. The Olsen Specimen, PCGS and NGC PR-64, named for early owner Fred Olsen, sold in Aug. 2003 for $3 million to an anonymous buyer. The Eliasberg Specimen of the 1913 Liberty Head Nickel has been graded Proof-66 by both PCGS and NGC. (It currently resides in PCGS capsule number 999999-001.) Legendary coin collector Louis Eliasberg bought his specimen in 1948. It remained in his collection until 1996, when it sold for $1,485,000. Within 5 years, it sold again at public auction for $1.8 million. Then, just over 2 years later, it sold once more for $3 million in a private transaction. It is worth noting that the second-best specimen of the 1913 Liberty Nickel, the Olsen coin, (graded Proof-64 by PCGS and NGC) also sold privately for $3 million on May 20, 2004. How much will the Eliasberg specimen sell for this time?